Improved CPU power savings and turbo support..
Network code optimizations (RPS/RFS) for multicore CPUs. Direct I/O support for Btrfs file system. Support for EDAC on Core i7 and Xeon CPUs. Hundred of driver updates and additions. The GNOME base platform has been updated to the current 2.32 versions. This particularly includes the new dconf and gsettings API. The Ubuntu Software Center has an updated look and feel, including the new “Featured” and “What’s New” views for showcasing applications, an improved package description view, and a “For Purchase” software category has been added. You can also now easily access your package installation history too. 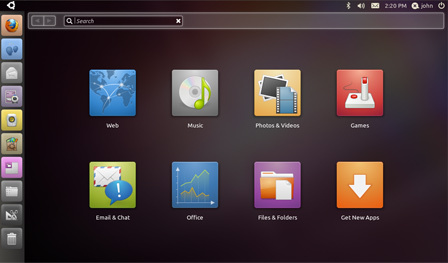 The new Unity interface is now the default in Ubuntu Netbook Edition.